I’ve learnt to crochet by the end of last summer, thanks to my mum who had the patience to teach me this art, and in just a few weeks crochet has become a very important part of my days. During one of my first days looking for yarns I found this wool (bouclé, isn’t it? 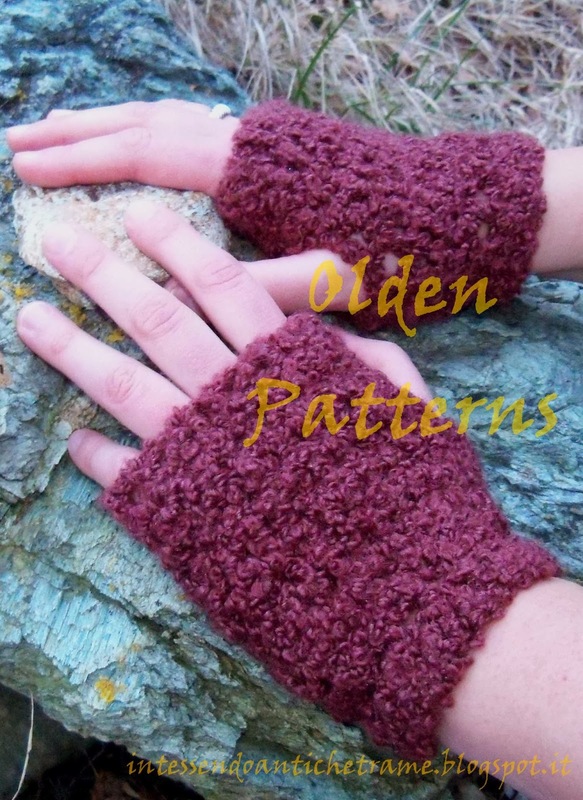 ), and I immediately thought of my mum, who loves peculiar wools; I made these mitts for her, the first pair of many to come, began and finished them in just one October afternoon. I thought they were especially nice for that season, their color reminded me of grape, pure Autumn style, but I have to admit that they look nice during Winter, as well. I was right thinking she would like them – it was love at first sight. Small gift indeed for someone who helped me so much. Hanno un bellissimo colore,ma tua mamma sarà stata felicissima perché glieli hai fatti tu,a prescindere da tutto il resto!